If you’re in search of the right plants and trees for fall color in the Pacific Northwest, this blog post is for you. Thoughtful plant design results in a garden that offers year-round interest, and fall is the season when some plants finally have their time to shine. 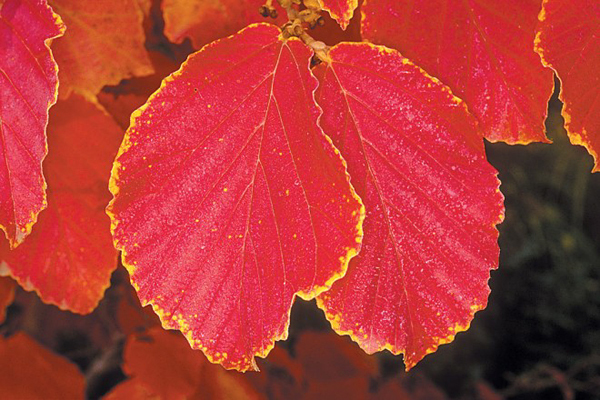 Horticulture consultant Christina Pfeiffer noted at a recent plant seminar I attended at the UW Botanic Gardens that garden practices can affect the quality of fall color. Applying too much nitrogen and moisture through the end of the season can retard color production and delay the onset of dormancy. For good fall color, provide moisture and nutrients early in the growing season, then allow plants a period of mild stress with less water later late in the season. In other words, just like with humans, a little stress kicks certain processes into gear that can be beneficial. Diane witch hazel (pictured above) – Known for its deep red flowers in winter, its crimson red fall foliage is a showstopper. It’s classified as a shrub, though it can be pruned to have the appearance of a small tree as it can grow to 20′ tall and 10′ wide. Plant it in your woodland garden or in transition zones where unmanaged land meets landscaped areas. 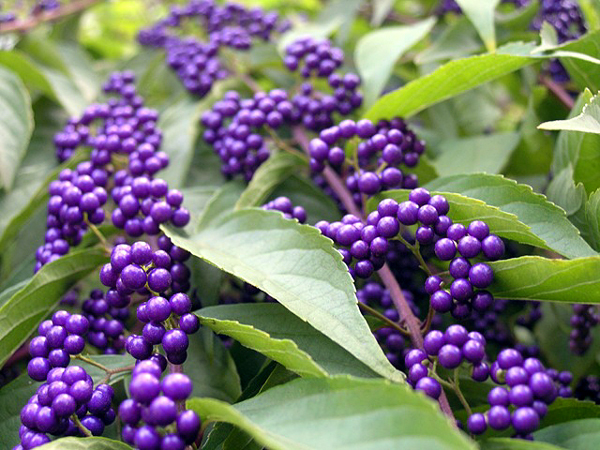 Beautyberry – I fondly remember my first introduction to this low maintenance, adaptable shrub. The sight of its clusters of small, violet-purple berries captivated and surprised me, as I’m sure it does to every other plant lover who comes across it for the first time. Its ornamental berries attracts birds, perhaps more so once there’s nothing else for them to eat. Plant it alongside sage, lavender or coneflower for a backyard wildlife santuary. 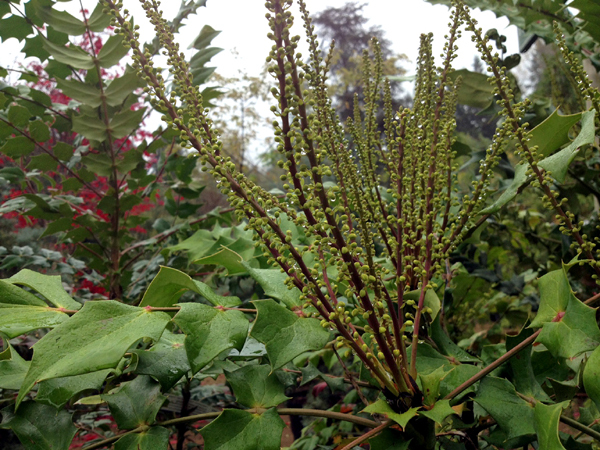 Arthur Menzies mahonia – This tough, evergreen native offers striking foliage and yellow buds that appear in fall in preparation for winter bloom. Who doesn’t love a winter bloomer? Sprays of yellow flowers develop into grape-like, greenish-blue fruit that turn black by summer. Birds love it. Hummingbirds love it, and rely on its nectar in winter when they most need it. 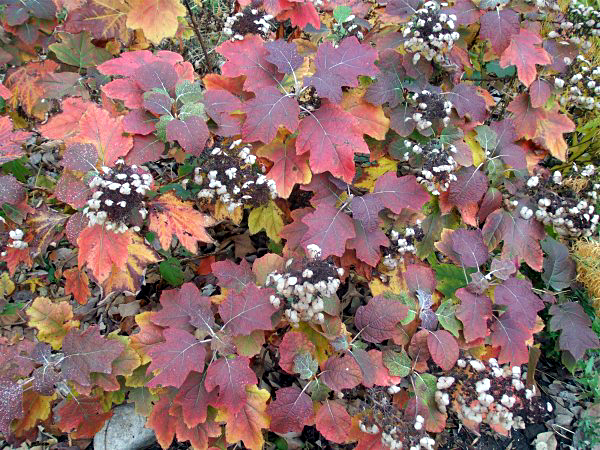 Oakleaf hydrangea – Not only does this hydrangea give you creamy white blooms in the summer, but its leaves turn a brilliant red in fall, with specks of yellow, orange and burgundy. 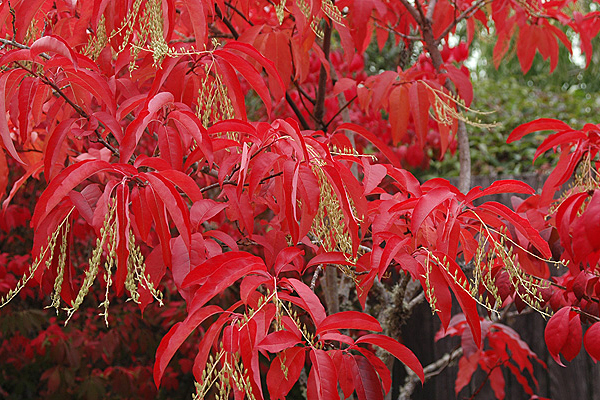 As you can tell from the photo above, this is a fantastic plant for fall color. ‘Alice’ reaches 12′ – 15′ tall and wide, making it a great companion to a small tree. Plant it in a cluster to really feel the impact that this deciduous shrub offers. Sourwood – We planted this tree in a client’s front yard in September when its glossy leaves had already transformed from green to a goldish-red color. Should we have returned in a week or so, its leaves at that time would have been maroon. Sourwood is a slow grower, though it will reach 30′ in height in maturity. On our walk through the UW gardens, Christina pointed out a handful of Sourwood trees that had been planted over a hundred years ago. Those old-timers were over 50′ tall and quite majestic. Even though it was a rainy, Northwest day, I very much enjoyed Christina Pfeiffer’s seminar. By now, some of you reading this may be thinking to yourself, “Why hasn’t she mentioned any Japanese maples?” There’s a good and simple reason for this. Without a doubt, they are reliable trees for fall color. However, homeowners, gardeners and landscapers alike have planted a tremendous amount of Japanese maples in our region, which puts our shared landscape at risk should a disease or insect attack them. The lesson here is that plant diversity is beneficial, and all of us should have another go-to tree for fall color as an alternative to the Japanese maple. What are your favorite plants and trees for fall color? Log into Facebook and let us know in the comment section below!